Cork is a natural product with excellent properties: even if it is not very popular with the contemporaries, it has been used for thousands years by man to insulate, seal, protect. No artificial material of “modern” concept has been tested as much as cork in such differing usages. This ancient and honest material was used by LIS to produce insulating panels a long time ago, in 1968, when nobody would speak about bio-compatible materials (a word that is nowadays used by everyone and many times, we must say, at the wrong moment or off the point), taking a courageous decision that was, at that time, against the mainstream. When the building industry was invaded by chemistry, by materials derived from oil, when the old, healthy and tested technologies of building were neglected in favour of a not well defined “modernity” and subordinating everything to a warped concept of economy, LIS made an alternative choice, working with patience and seriousness, developing technological researches and always taking as a reference not only the quality and the performance of the product, but also the quality of human life. If we look at the whole world, cork is born only here.The cork oak does not grow anywhere else. It prefers the Mediterranean climate and the land rich in potash. 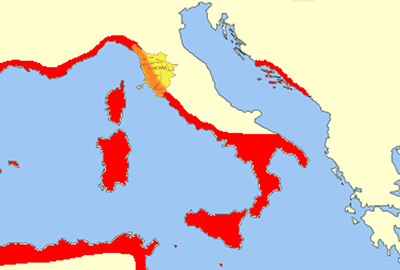 These environmental conditions are exactly those of a limited strip of the Mediterranean basin.